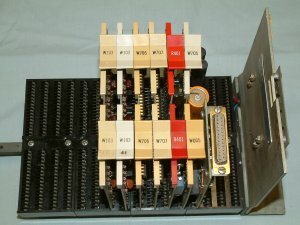 The PT08 is used to add a serial port to negative bus PDP-8's. This was needed on PDP-8/S since it didn't have an internal serial port. The original PDP-8 and the PDP-8/I had one built in serial port so a PT08 was only needed if more that one serial port was needed. I am using it on my 8/I to allow me to run the EduSystem 20 multi user basic with two users. The PT08 normally would be used to talk to an 8 bit teletype such as a ASR-33 but could be configured to talk to a 5 bit baudot teletype. With an external current loop to RS-232 converter or a custom W070 like this one has it can be used to talk to a normal CRT terminal. The PT08 uses the R401 RC clock to set the baud rate which requires you to jumper the correct capacitor on the backplane and then adjust the variable resistor to set the baud rate. The W706/W707 which have the serial port logic are made using Motorola Resistor Transistor Logic ( RTL) chips. Transistor Transistor Logic ( TTL ) chips where introduced a couple years after RTL chips and had better performance so they soon became the dominant chip type. These cards are the only PDP-8 boards I know of which use RTL IC's.